I went to see Christopher Nolan’s Dunkirk fully expecting to loathe it: I had heard it was swashbucklingly patriotic, a film glorifying the departure from France in 1940, with the heroic evacuation from Dunkirk serving as an analogy to contemporary Britain’s timely escape from the clutches of a Merkel-dominated European Union. What I actually saw was a film about destruction and death. 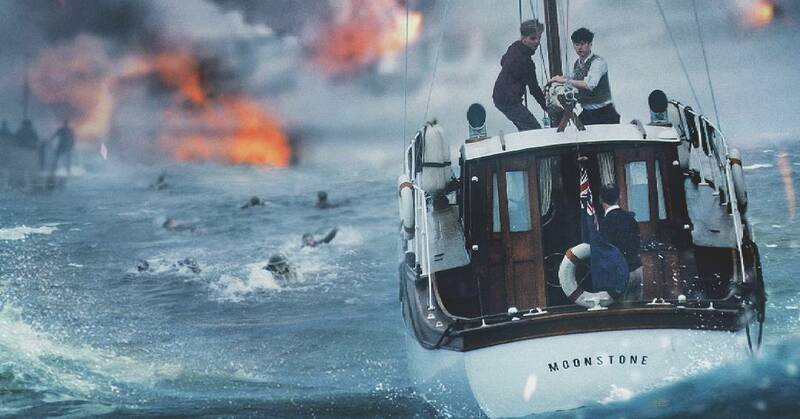 The film’s repeated focus on the bombing and torpedoing of ships, the recurring images of stricken vessels sinking rapidly as panicked soldiers drown in their hundreds mean that it is simply not possible to see in Dunkirk an uncomplicated celebration of British pluck. Dunkirk is in first instance an antiwar film, a film in which the four elements —earth, water, air and fire— are turned against man as planes and submarines wreak havoc on Britain’s Expeditionary Force. Soldiers lined up in orderly queues on the beach end up strewn over the ocean. Each of the three central narratives can certainly be construed as being heroic, but this is a fractured, ambivalent and uncertain heroism. The brave owner of a private boat, Dawson, who, together with his son, rescues a sailor, a pilot and soldiers is a model of quite, modest determination. But when his teenage hand George is fatally wounded by a shellshocked officer, Dawson never for a moment thinks of returning to England, any more than he does when the traumatised officer, horrified by the idea of returning to the hell of Dunkirk, insists he turn the boat round. Individuals are sacrificed to the higher ideal, and Nolan does not hide the cost. In the second narrative, we see more brave chaps, British Spitfire pilots, doing their bit to down Stukas and German Heinkel bombers, and while they notch up some successes, they can do nothing to stop the German submarine torpedoes from sinking ships. The destruction caused by the Heinkel bombers is never really stopped either —even when shot down, one of them sets fire to a film of oil on the sea’s surface and causes the deaths of soldiers who thought they had escaped death on a sinking ship. Tommy, hero of the third of the narratives (or first, if we follow the film’s ordering), is an individual adept at survival, someone who gets through because of his luck, presence of mind and unflappable calm, but not because anyone helps him— except for a French soldier who is later subjected to the full contempt of British soldiers ready to sacrifice him to save their own lives. Tommy is not the patriotic hero, he has no time for national pride; he just wants to live, instinct guides him, though he never loses his human decency. He is the mirror held up critically to our notions of Dunkirk as some kind of spirited exercise in national self-protection, and to our utter contempt of the French —supposed to be Allies. Of course there is rescue, but those who found the film too patriotic completely misunderstood the mise-en-scène. When a flotilla of small boats appear on the horizon, they do so under the tearful gaze of Navy commander Bolton, played by Kenneth Branagh, who is watching them through binoculars. Binoculars, here, are like opera glasses: and indeed there is something quite operatic about the way Nolan stages the sudden arrival of the tiny yachts and pleasure boats, their crews standing absolutely still as if ready to burst out into song in a Wagnerian opera chorus, perhaps The Flying Dutchman? Matchstick figures on matchstick boats —that is how Nolan serves up the rescue, to the broken strains of Elgar’s Nimrod. Nimrod almost comes completely into its own in the final scenes, where a spitfire pilot, whose plane has run out of petrol after heroic exploits, glides wistfully and elegantly down onto the empty beach. Yes, this scene brings a tear to the eye. Given the film’s unmitigated portrayal of what war really means, a moment of gentle heroism cannot be wrong, can it? But again it is the personal heroism of survival, of getting through, making it. And the pilot soon gets carted off to a POW camp by the approaching Germans. He does not have much time to play the hero. Nolan has surprised me. I did not expect a film like this from him. Every moment of heroism is contrasted, undermined, questioned. He does not deny heroism, but he sets it in relation. That audiences and critics did not notice this is disappointing. We are so marinated in traditional and epic British war films, it seems, that setting heroism in relation is not enough to wake us up. That some were bored by Dunkirk is not a good sign. Sinking ships and mass death clearly do not enthuse. We should be worried that we want to be enthused. The next step is for someone who is an even better director than Nolan to make us reflect hard on why we find sinking ships and mass death boring, rather than distressing. Britain lacks a sense of realism.